If you are determined to make money legally online. Then you are going to find tons of opportunity online. And if you decide to use these online opportunities, then you will need one or two platforms to receive your payments. If this is your case then Payoneer is one of your best options. Payoneer is an online financial service provider that offers you a debit MasterCard called the Payoneer card. With this card you can directly withdraw fund from your Payoneer account via any local ATM you find around with the MasterCard logo. A Payoneer card can easily be applied or ordered, once you have an active Payoneer account of which you have used to receive one or two payments. Payoneer has been said to be some people rescue, who are making money online and so proving making real money online no longer scam. This is because Payoneer issues to all its applicants a virtual U.S bank accounts to interested users. And links those accounts to their user cards, making it possible to make transactions in so many different currencies. With the Payoneer account, users no longer need a fake ID to run transaction from other countries. If you finally decide that you are interested in an online journey then you must first of all create a Payoneer account and then order for your Payoneer card. There are two ways of which you can order for a Payoneer card. You can either apply for a Payoneer card while opening your Payoneer account or after you have created your Payoneer account. 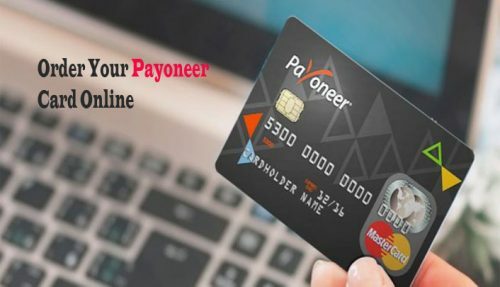 Visit the official Payoneer Account sign up page at https://payouts.payoneer.com/partners/or.aspx?pid=YOYIZC74IO2s4KZQp7tgsw%3d%3d&langid=1&locale=en Answer the questions and then fill the empty boxes with the accurate information required of you. Click on the next button and complete your setup. Once that is done you can easily order our Payoneer card. Now to order your Payoneer card, login to your online Payoneer account via the official Payoneer website www.payoneer.com On your account, click on the “settings” icon and then on card management. Wait a few minutes and locate the order a card button. If you do not find it, that means you are not eligible. Most people are not eligible until after their first payment from online earning platforms. Click on the order a card button and then enter your mail address/billing address and complete the order.